Copyright © Bänoo Zan. Originally published in Gaea Calling: Community, Insight, Influence, 2017. Bänoo Zan is a poet, librettist, translator, teacher, editor and poetry curator, with more than 170 published poems and poetry-related pieces as well as three books. Song of Phoenix: Life and Works of Sylvia Plath, was reprinted in Iran in 2010. 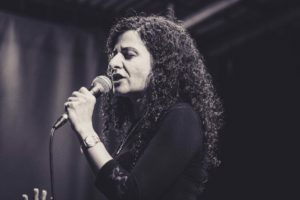 Songs of Exile, her first poetry collection, was released in 2016 in Canada by Guernica Editions. It was shortlisted for Gerald Lampert Memorial Award by the League of Canadian Poets in 2017. Letters to My Father, her second poetry book, was published in 2017 by Piquant Press in Canada. She is the founder of Shab-e She’r (Poetry Night), Toronto’s most diverse poetry reading and open mic series (inception: 2012). It is a brave space that bridges the gap between communities of poets from different ethnicities, nationalities, religions (or lack thereof), ages, genders, sexual orientations, disabilities, poetic styles, voices and visions. Find Bänoo on Instagram @banoo.zan and Twitter at@BanooZan & @ShabeSherTo.